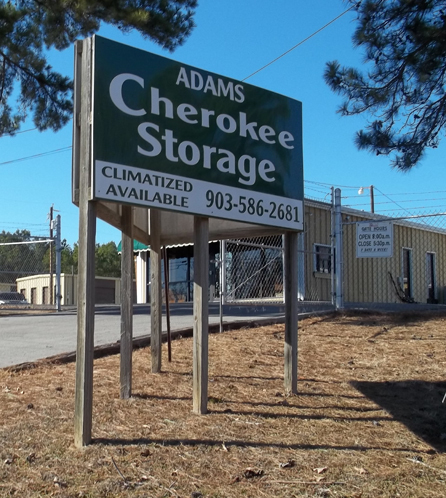 Adams Cherokee Storage is a locally owned and operated self storage facility in Jacksonville, Texas. We are conveniently located at 1300 East Pine Street (Highway 135). We offer both climate controlled and non-climate controlled units in a variety of sizes. We have the size that will fit your needs. The property is well lighted and surrounded by a fence. The gates are open to tenants from 8 am – 5:30 pm 7 days a week. The gates have security cameras and record each vehicle upon entering and exiting the facility. The climate controlled units have a personal access code into each building. There are security cameras inside each climate controlled building. For your convenience, we offer a drive through window to make payments in person. You may make payments by cash, check or over the phone with a credit card. Upon renting a unit, there is NO Deposit or Administrative Fee.